I am heartbroken every time someone tells me their child is being bullied. The stories are scary and upsetting. And the worst part is, unnecessary. This is an education problem. There is a method that works to get bullying to stop and we aren’t teaching it. To anyone. Well I am. But I am just one person. And clearly, as much as I am doing, it isn’t enough. I need help. Bullies are inevitable but being bullied is not. We can the knowledge of 70 plus years of behavioral science and teach kids what they really need to know. There is a science to getting unwanted behavior to stop. Most of the anti-bullying programs already teach the first part of the method. The reason we still have bullying problems is because – as important as that first part is, it’s not as important as what happens next. Basically, when you want to stop an unwanted behavior, you eliminate the reward. In bullying speak this is often phrased as “ignore them and they will go away.” The first problem we have is that eliminating the reward is NOT the same as ignoring them. What happens next is what were we are failing. 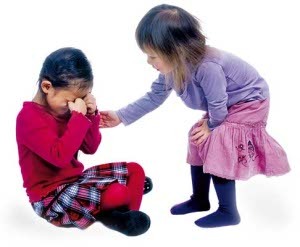 Once you remove the reward the bully will escalate their behavior, a little or a lot. We need to start teaching kids to expect it and tell them what to do WHEN not if it happens. Only then will our kids finally have the knowledge they need to get bullies to stop. I am heartbroken every time someone tells me their child is being bullied. I feel like I failed them by not getting them this information sooner. I get mad because we have 70 plus years of research that tell us exactly what we need to teach and yet – we still aren’t teaching it!!!! If you are reading this blog, please help me. I can’t reach every parent in America or in the world on my own. Share this blog and my book with your friends. If you have a business, purchase some books at cost and give them to your customers. Or better yet, donate them to the mental health department at your local school. They can get continuing education credit for reading it. Let’s get to work and get the word out that bullying isn’t inevitable and that there is in fact science that will help us make it stop.